Home » Wooden floor wax, is DIY really convenient? DIY is a strong trend in the last years, also in the field of wooden floor wax. With a simple web research, you can find many tricks to realize a homemade wooden floor wax. Among these, the vinegar-based ones promise to carry out a degreasing action on the wooden floor along with the protective action of the wax, the linen oil and the detergent one of the alcohol. Preparation: destroy carub wax with a hammer and mix it – in a recipient not made of metal – to the beeswax and the linen oil, carefully mixing with a wooden spoon. Pour the compound in a small saucepan and let it melt it in a bain-marie. Take it off the fire when it will be melt and add vodka and the essential oil. Pour the compound in a metal pot and put it in the fridge for a couple of hours or under ambient temperature until consolidation. At this point, wax will be ready to use and you can conserve it for a long time in a cool and dry place. But is it really convenient to produce wooden floors wax at your house? After a deep analysis, the answer is always the same: probably not. On the market, you can find many safe and professional products for your wooden floor, but they can be eco-friendly too. In the Solid wooden floor coatings range you can find SolidWax, a wooden floor gloss effect wax with the Eco-Friendly label (as every Solid product) and is also a professional product. SIt is a liquid wax, easy to apply with a cloth. It is ready to use. With a yield per coat of 25 m2/L, SolidWax protects every wooden floor and give it a brilliant effect, with no risks of damage (as with DIY waxes). 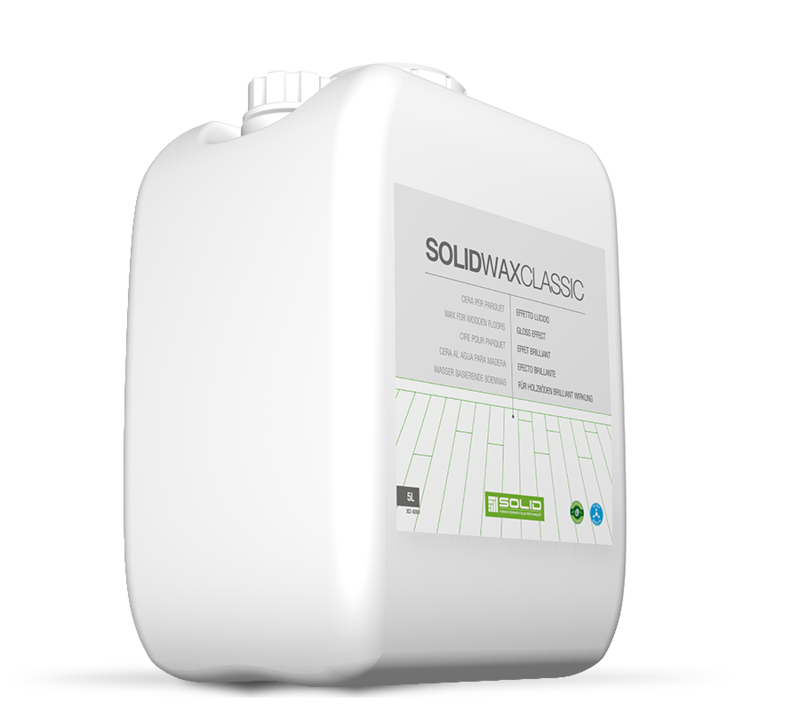 Discover SolidWax and all the other products of Solid range.